To Cite: Mohammadi Shayan A, Rassouli M, Kimyai S, Valizadeh H, Ahangar Atashi M H, et al. Comparison of the Application of Different Fluoride Supplements on Enamel Demineralization Adjacent to Orthodontic Brackets: An In Vitro Study, Iran J Ortho. Online ahead of Print ; 14(1):e64157. doi: 10.5812/ijo.64157. Background: White spot lesion is considered as one of the main problems in the orthodontic treatment. Brackets used in fixed orthodontic treatment create an environment that provides enamel demineralization. Objectives: The objective of the current study was to perform an in vitro study to compare different applications of fluoride supplements on enamel demineralization adjacent to orthodontic brackets and finally to understand the best supplement to recommend the patients. Methods: One hundred and twenty extracted caries-free human premolar teeth were randomly assigned into six groups: group 1: Control group, group 2: Fluoride toothpaste, group 3: Fluoride toothpaste/mouth rinse, group 4: Fluoride toothpaste/vanish, group 5: Fluoride toothpaste/gel and group 6: Fluoride toothpaste/foam. After bonding the brackets to the teeth, the fluoride supplements were applied based on each group above, except the control group. Then all the specimens were cycled for 30 days in demineralization solution for 8 hours a day, rinsed, placed in artificial saliva for 4 hours a day, brushed (except the control group), and put back to artificial saliva for 12 hours. DIAGNOdent laser fluorescence was used to quantify the demineralization changes. Results: Significant differences existed between all fluoride-containing groups and control group. Analyses of the results showed a significant difference between control group and the rest 5 treatment groups (P < 0.001). Other significant differences were between groups 2/5, 3/5, 2/4 and 5/6 (P < 0.05). There was no significant difference among the other groups (P > 0.05). Conclusions: According to the results, all fluoride supplements could be used during orthodontic treatment to decrease the enamel demineralization. It has been illustrated that fluoride-containing toothpaste and mouth rinse is better than no fluoride treatment but is not effective as well as fluoride gel and varnish. White spot lesions represent superficial dissolving of enamel of the tooth. Enamel demineralization is the primary stage of tooth decay (1, 2). Fixed orthodontic appliances using brackets are one of the reasons of enamel demineralization because the brackets are closely attached to tooth surface and these attachments prevent achieving adequate oral hygiene (3). Enamel demineralization occurs at low pH when the enamel crystals are dissolved by organic acids such as lactic and acetic acid which are produced by plaque and biofilm. The acidogenic bacteria of biofilm can transform fermentable carbohydrates to organic acids (4, 5). The buccal surface of teeth is usually the region of bonding of fixed orthodontic appliances and due to inadequate cleansing of this area, it is more sensitive to enamel demineralization (5). The prevalence of enamel demineralization during orthodontic therapy has been reported about 50% and can be developed only one month after the beginning of the treatment (6-8). There are some methods to produce an accurate reading of the mineral content of dental enamel. One of the most commonly is DIAGNOdent. DIAGNOdent is a portable laser fluorescence apparatus which works simple, provides quantitative comparable data and can detect the mineral loss of enamel before the cavity formation (9). Enamel demineralization is early decay but can be reversible and fluoride can decrease the white spot lesions (10-12). There are some various forms of fluoride now a days. Therefore, the aim of this study was to compare different fluoride therapies including fluoride-containing toothpaste, mouth rinse, varnish, gel and foam during an in vitro study and to find the most effective treatment to recommend the patients. In this study 120 extracted caries-free human premolar teeth, which had been extracted for orthodontic reasons were randomly collected from the Department of Oral Surgery, Tabriz Faculty of Dentistry, Iran. The research was reviewed by the Ethics in Research Committee of Medical University of Tabriz, Iran. The collected teeth were kept in 0.1% thymol solution at room temperature. Soft tissue remnants and debris were removed from teeth and they were randomly divided into different 6 groups, of 20 each. Group 1: Control group; without treatment, group 2: Fluoride-containing toothpaste group (Oral-B pro-expert enamel protected toothpaste, Oral-B, USA), group 3: Fluoride-containing toothpaste/mouth rinse group (Oral-B pro-expert multi protection alcohol free mouthwash 0.05% Sodium Fluoride, Oral-B, USA), group 4: Fluoride-containing toothpaste/vanish group (5% Sodium Fluoride Varnish Fluorilaq™, Pascal, USA), group 5: Fluoride-containing toothpaste/gel group (pH7® Neutral 2% Sodium Fluoride Fluoride Gel, Pascal, USA) and group 6: Fluoride-containing toothpaste/foam group (PUFF®, 2.0 % Neutral Sodium Fluoride Non-Aerosol Foam, Pascal, USA). Randomly assignment of the teeth to the groups was performed by using random list numbers. Before bracket bonding, the roots of the teeth from CEJ to apex were mounted in cubes made of self cure polymethyl metaacrilate acrylic resin (PMMA) (Acropars Self-cure, Marlik, Medical Co, Iran) and then were polished with rubber cup and fluoride-free prophylactic paste, then were rinsed and were dried with air. All of the surfaces of teeth except the place of the bracket were covered by a tape. The standard edgewise bracket, slot 0.022 inches for premolars (American Orthodontics, USA) was bonded to the center of buccal surface, 3 mm gingivally from buccal cusp tip. The window on buccal surface was etched with 37% acid phosphoric gel (Dia-Etch, DiaDent, Korea) for 30 seconds and then rinsed and dried. The light cure resin bonding composite (Transbond XT, 3M Unitec, USA) was used for bonding, cured with light cure device (D-Lux, DiaDent, Korea). The intensity of light 1600 mw/cm2, its wavelength 450 nm for 10 second. The tape was then removed. The enamel fluorescence was determined beneath the bracket base on gingival surface by DIAGNOdent (KaVo, Germany) prior to fluoride treatments (fluorescence value1: FV1). The teeth were kept in artificial saliva for 16 hours at room temperature. After that the teeth were removed, rinsed, and fluoride supplements were applied based on each group above, except for the control group. The artificial saliva contained of different materials listed in Table 1. Applying fluoride toothpaste involved twice daily brushing for 2 minutes finished by swishing of toothpaste and water for 30 seconds (13). Daily use of 0.05% sodium fluoride mouth rinse in accompany with fluoride toothpaste was the most recommended fluoride regimen by orthodontists (14). Fluoride varnish was applied around brackets with the aid of brush applicators during orthodontic treatment (15). For applying fluoride gel and foam, trays were filled about 1/2 to 1/3 with gel and fully with foam and fluoride therapy came about in 4 minutes (16, 17). Teeth were rinsed again after treatment and put in to the demineralization solution (acetic acid 50 mM, NaH2PO4, 2H2O 2.2 mM, CaCl2 2.2 mM, KOH 1 M) which has been described by ten Cate and Duijsters, pH 5.0, for 8 hours at room temperature (18). All of them except the control group were brushed by orthodontic brush (Oral-B orthodontic brush, Oral-B, USA) and fluoride-containing toothpaste (Oral-B pro-expert enamel protected toothpaste, Oral-B, USA). The teeth were put back to artificial saliva for 12 hours until the next fluoride therapy. These procedures were repeated every day for 30 days. The enamel fluorescence was determined after treatment by DIAGNOdent and fluorescence value2 (FV2) was recorded for each tooth of the 6 different groups. The technicians were blind for different groups in this procedure. ∆FV (FV2-FV1) was recorded for each tooth of 6 groups. The mean and standard deviation of ∆FV were calculated for each group (Table 2). According to Kolmogorov-Smirnov test, the hypothesis of normality of data was rejected. Therefore, One-way ANOVA analysis could not be used in this case. Since P value of levene’s test was less than 0.001 and it was concluded that the variance of fluorescence value was not homogeneous in the six groups, therefore non parametric evaluation test (Kruskal Valis) was selected to analysis data pre and post fluoride treatment and the data was analyzed by Mann-Whitney test to compare between groups. The P value < 0.05 was considered as significant difference between heterogeneous groups by SPSS software (version 19). As the mean and standard deviation of ∆FV for each group has been listed in Table 2, the highest mean was for control group (14.64) and the lowest mean was for fluoride-containing toothpaste/gel group (group 5 = 4.10). The levene’s variance between control group and the rest 5 groups was significant (P < 0.001). 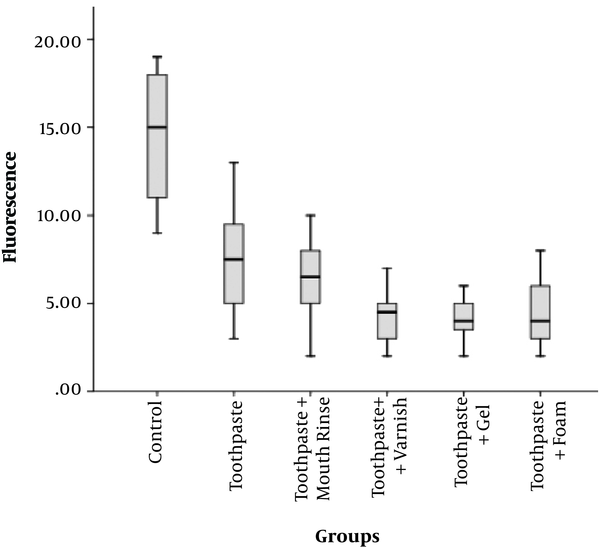 Another significant variances were between fluoride-containing toothpaste and fluoride-containing toothpaste/gel group (group 2 and 5) (P = 0.001), fluoride-containing toothpaste/mouth rinse group and fluoride-containing toothpaste/gel group (group 3 and 5) (P = 0.005), fluoride-containing toothpaste and fluoride-containing toothpaste/varnish group (group 2 and 4) (P = 0.007), fluoride-containing toothpaste/gel and fluoride-containing toothpaste/foam group (group 5 and 6) (P = 0.015), The rest of variances between groups was non-significant (P > 0.05) Table 3 and Figure 1. Abbreviations: F, foam; G, gel; MR, mouth rinse; NS, non-significant; S, significant; TP, toothpaste;V, varnish. In spite of many improvements in orthodontic techniques, enamel demineralization is still one of the most important challenges of orthodontic therapy. Fixed appliances in orthodontic treatment can increase the incidence of white spot lesions from 73% to 95% (1, 19). In another study the prevalence of enamel demineralization before orthodontic therapy was 32% and after that was 74%, 10% of them with cavity (20). According to the study, after demineralization-remineralization cycle (30 days) the mean and standard deviation of fluorescence were increased. This means that demineralization occurred in all groups. This increase was much higher in control group than all treatment groups. There are some different mechanisms for enamel demineralization reduction by fluoride therapy in oral cavity; fluoride ions adsorb on the surface of enamel crystals and make a barrier for organic acid dissolving of enamel crystals, therefore, fluoride inhibits enamel demineralization. Fluoride also inhibits the bacterial enzymes which produce organic acids (12, 21). Fluoride induces the enamel remineralization by settlement of the Calcium and Phosphate ions of saliva (4, 22). According to the results, fluoride containing toothpaste was significantly better than control group but there was also significant difference between fluoride containing toothpaste group and fluoride containing foam, varnish and gel (P < 0.05). This difference might be caused by these complicated cumulative components of calcium phosphate and fluoride ions of these products. Fluoride containing foam, varnish and gel can be saturated on teeth and lead to enamel demineralization suppression. In an in vitro study that demineralization had been created by lactate and acetate buffer. The enamel demineralization had been reduced by fluoride treatment which was analyzed by energy dispersive X-ray (23). Fluorides containing mouthrinse and toothpaste have been recommended by many orthodontists to reduce enamel demineralization during orthodontic therapy. In this research, enamel demineralization was decreased by fluoride containing mouthrinse and toothpaste but there was no significant difference between fluoride containing mouthrinse and toothpaste group and fluoride containing toothpaste group (P > 0.05). Similar result was observed in Geiger et al. study which they found no significant difference between fluoride containing mouthrinse and toothpaste against WSL in orthodontic patients (24). Fluoride varnish was effective on enamel demineralization reduction, remineralization improvement and caries cure (remission) closed to orthodontic brackets (15, 25, 26) as well as some similar studies on orthodontic patients (27-29). According to the results, fluoride varnish was significantly better than control groups (P < 0.05). Fluoride varnish had significantly decreased interproximal enamel demineralization which had been assessed by scanning electron microscopy (SEM) and energy dispersive X-ray (EDS) in an in vitro study (P < 0.05) (30). In an in situ observation of enamel demineralization by SEM and EDS, titanium tetrafluoride varnish could significantly decrease enamel demineralization (P < 0.05) (31). Fluoride varnish has a sticky potential on teeth, therefore calcium fluoride precipitate as a source of fluoride ions for low pH plaques. Combination of fluoride containing mouthrinse, varnish and gel was more effective on enamel demineralization decreasing in comparison with separate usage of these products (32). In this research, fluoride varnish and toothpaste group was significantly more effective on enamel demineralization reduction than fluoride containing toothpaste group (P < 0.05) but there was no significant difference among fluoride varnish with fluoride gel and foam groups (P > 0.05). Fluoride gel was significantly better than fluoride containing mouth rinse (P < 0.05). Different density of fluoride gel and mouth rinse and duration of treatment could have caused this difference. In this study, not only fluoride gel and foam were significantly different with control group (P < 0.05) but also fluoride gel was significantly better than fluoride foam in enamel demineralization reduction (P < 0.05). It could be result of low density and high solubility of foam (17). Therefore, this substance was rinsed easily from dental surface. In some similar studies fluoride gel affected on enamel demineralization reduction (16, 33, 34). Fluoride gel and foam was observed effective on remineralization improvement (35). There were some difficulties during this research, that one of the most important one, was finding suitable premolar teeth for the study which was time consuming. Although, there are some new techniques such as quantitative light fluorescent (QLF) and scanning electron microscopy (SEM) with energy dispersive X-ray (EDS) analysis that can compensate to DIAGNOdent for assessment of enamel demineralization but such equipment didn’t exist in Tabriz Faculty of Dentistry, Iran. There are some different factors that can cause enamel demineralization in a patient during orthodontic therapy such as diet, oral hygiene, saliva (its flow rate and pH) and microbial factors (4, 22, 36). In Iran, there is no information of enamel demineralization prevalence during orthodontic therapies but it is proposed that the prevalence is more than the developed countries. According to the results, it is recommended that one of the most effective fluoride supplements -fluoride gel, fluoride varnish and fluoride foam is used as a routine procedure during orthodontic therapy. The final goal of this in vitro study was to find the best solution for the enamel demineralization during orthodontic therapy for patients but it is recommended that it will be completed by an in vivo study to compare the results because the intervals of the fluoride applications are different in real condition. It is also recommended that prior to orthodontic treatment, the susceptibility of the patient is assessed then the most effective fluoride therapy is selected. Authors' Contribution: Study concept and design: Arman Mohammadi Shayan; acquisition of data: Monireh Rassouli; analysis, and interpretation of data: Soodabeh Kimyai; technical and material support: Hadi Valizadeh, Mohammad Hossein Ahangar Atashi, and Sahand Rikhtegaran; drafting of the manuscript: Monireh Rassouli; revision of manuscript: Soodabeh Kimyai. Ethical Considerations: The research was reviewed and approved by the Ethics in Research Committee of Tabriz University of Medical Sciences, Iran. We obtained verbal consent from all participants involved in our study for the use of their teeth. The consent procedure was approved by the ethics committee/institutional review board. The research has been conducted in full accordance with the World Medical Association Declaration of Helsinki. Funding/Support: The Faculty of Dentistry, Tabriz University of Medical Sciences, Tabriz, Iran has funded this research. 1. Lovrov S, Hertrich K, Hirschfelder U. Enamel demineralization during fixed orthodontic treatment-incidence and correlation to various oral-hygiene parameters. J Orofac Orthop. 2007;68(5):353-63. doi: 10.1007/s00056-007-0714-1. [PubMed: 17882363]. 2. Benson PE, Parkin N, Dyer F, Millett DT, Furness S, Germain P. Fluorides for the prevention of early tooth decay (demineralised white lesions) during fixed brace treatment. Cochrane Database Syst Rev. 2013;(12). CD003809. doi: 10.1002/14651858.CD003809.pub3. [PubMed: 24338792]. 3. Burkland G. Hygiene and the orthodontic patient. J Clin Orthod. 1999;33(8):443-6. [PubMed: 10613136]. 4. Chang HN, Garetto LP, Potter RH, Katona TR, Lee CH, Roberts WE. Angiogenesis and osteogenesis in an orthopedically expanded suture. Am J Orthod Dentofacial Orthop. 1997;111(4):382-90. doi: 10.1016/S0889-5406(97)80020-0. [PubMed: 9109583]. 5. Maxfield BJ, Hamdan AM, Tufekci E, Shroff B, Best AM, Lindauer SJ. Development of white spot lesions during orthodontic treatment: Perceptions of patients, parents, orthodontists, and general dentists. Am J Orthod Dentofacial Orthop. 2012;141(3):337-44. doi: 10.1016/j.ajodo.2011.08.024. [PubMed: 22381494]. 6. Gorelick L, Geiger AM, Gwinnett AJ. Incidence of white spot formation after bonding and banding. Am J Orthod. 1982;81(2):93-8. [PubMed: 6758594]. 7. Øgaard B, Rølla G, Arends J. Orthodontic appliances and enamel demineralization: Part 1. Lesion development. Am J Orthod Dentofacial Orthop. 1988;94(1):68-73. doi: 10.1016/0889-5406(88)90453-2. [PubMed: 3164585]. 8. Gorton J, Featherstone JD. In vivo inhibition of demineralization around orthodontic brackets. Am J Orthod Dentofacial Orthop. 2003;123(1):10-4. doi: 10.1067/mod.2003.47. [PubMed: 12532056]. 9. Girenes G, Ulusu T. An in vitro evaluation of the efficacy of a novel iontophoresis fluoride tray on remineralization. J Clin Exp Dent. 2014;6(4):e327-34. doi: 10.4317/jced.51376. [PubMed: 25593651]. [PubMed Central: PMC4282896]. 10. Cruz R, Ögaard B, Rölla G. Uptake of KOH‐soluble and KOH‐insoluble fluoride in sound human enamel after topical application of a fluoride varnish (Duraphat) or a neutral 2% NaF solution in vitro. Scand J Dent Res. 1992;100(3):154-8. doi: 10.1111/j.1600-0722.1992.tb01732.x. [PubMed: 1631484]. 11. Ogaard B. CaF(2) formation: Cariostatic properties and factors of enhancing the effect. Caries Res. 2001;35 Suppl 1:40-4. doi: 10.1159/000049109. [PubMed: 11359057]. 12. ten Cate JM. Contemporary perspective on the use of fluoride products in caries prevention. Br Dent J. 2013;214(4):161-7. doi: 10.1038/sj.bdj.2013.162. [PubMed: 23429124]. 13. Al Mulla AH, Kharsa SA, Birkhed D. Modified fluoride toothpaste technique reduces caries in orthodontic patients: A longitudinal, randomized clinical trial. Am J Orthod Dentofacial Orthop. 2010;138(3):285-91. doi: 10.1016/j.ajodo.2010.04.016. [PubMed: 20816297]. 14. Derks A, Kuijpers-Jagtman AM, Frencken JE, Van't Hof MA, Katsaros C. Caries preventive measures used in orthodontic practices: An evidence-based decision? Am J Orthod Dentofacial Orthop. 2007;132(2):165-70. doi: 10.1016/j.ajodo.2005.10.028. [PubMed: 17693365]. 15. Gontijo L, Cruz RA, Brandão PRG. Dental enamel around fixed orthodontic appliances after fluoride varnish application. Braz Dent J. 2007;18(1):49-53. doi: 10.1590/S0103-64402007000100011. [PubMed: 17639201]. 16. van Rijkom HM, Truin GJ, van 't Hof MA. Caries-inhibiting effect of professional fluoride gel application in low-caries children initially aged 4.5-6.5 years. Caries Res. 2004;38(2):115-23. doi: 10.1159/000075935. [PubMed: 14767168]. 17. Jiang H, Tai B, Du M, Peng B. Effect of professional application of APF foam on caries reduction in permanent first molars in 6-7-year-old children: 24-month clinical trial. J Dent. 2005;33(6):469-73. doi: 10.1016/j.jdent.2004.10.023. [PubMed: 15935266]. 18. ten Cate JM, Duijsters PP. Alternating demineralization and remineralization of artificial enamel lesions. Caries Res. 1982;16(3):201-10. doi: 10.1159/000260599. [PubMed: 6953998]. 19. Richter AE, Arruda AO, Peters MC, Sohn W. Incidence of caries lesions among patients treated with comprehensive orthodontics. Am J Orthod Dentofacial Orthop. 2011;139(5):657-64. doi: 10.1016/j.ajodo.2009.06.037. [PubMed: 21536209]. 20. Enaia M, Bock N, Ruf S. White-spot lesions during multibracket appliance treatment: A challenge for clinical excellence. Am J Orthod Dentofacial Orthop. 2011;140(1):e17-24. doi: 10.1016/j.ajodo.2010.12.016. [PubMed: 21724067]. 21. Lynch RJ, Mony U, Ten Cate JM. The effect of fluoride at plaque fluid concentrations on enamel de- and remineralisation at low pH. Caries Res. 2006;40(6):522-9. doi: 10.1159/000095652. [PubMed: 17063024]. 22. Lundstrom F, Krasse B. Streptococcus mutans and lactobacilli frequency in orthodontic patients; the effect of chlorhexidine treatments. Eur J Orthod. 1987;9(2):109-16. [PubMed: 3472888]. 23. Yu OY, Mei ML, Zhao IS, Lo EC, Chu CH. Effects of fluoride on two chemical models of enamel demineralization. Materials (Basel). 2017;10(11). doi: 10.3390/ma10111245. [PubMed: 29077034]. [PubMed Central: PMC5706192]. 24. Geiger AM, Gorelick L, Gwinnett AJ, Benson BJ. Reducing white spot lesions in orthodontic populations with fluoride rinsing. Am J Orthod Dentofacial Orthop. 1992;101(5):403-7. doi: 10.1016/0889-5406(92)70112-N. [PubMed: 1590288]. 25. Farhadian N, Miresmaeili A, Eslami B, Mehrabi S. Effect of fluoride varnish on enamel demineralization around brackets: An in-vivo study. Am J Orthod Dentofacial Orthop. 2008;133(4 Suppl):S95-8. doi: 10.1016/j.ajodo.2006.09.050. [PubMed: 18407027]. 26. Vicente A, Ruiz AJO, López MG, Beneyto YM, Bravo-González LA. Enamel resistance to demineralization after bracket debonding using fluoride varnish. Sci Rep. 2017;7(1):15183. doi: 10.1038/s41598-017-15600-5. [PubMed: 29123323]. [PubMed Central: PMC5680324]. 27. Sudjalim TR, Woods MG, Manton DJ, Reynolds EC. Prevention of demineralization around orthodontic brackets in vitro. Am J Orthod Dentofacial Orthop. 2007;131(6):705 e1-9. doi: 10.1016/j.ajodo.2006.09.043. [PubMed: 17561043]. 28. Stecksen-Blicks C, Renfors G, Oscarson ND, Bergstrand F, Twetman S. Caries-preventive effectiveness of a fluoride varnish: A randomized controlled trial in adolescents with fixed orthodontic appliances. Caries Res. 2007;41(6):455-9. doi: 10.1159/000107932. [PubMed: 17827963]. 29. Nalbantgil D, Oztoprak MO, Cakan DG, Bozkurt K, Arun T. Prevention of demineralization around orthodontic brackets using two different fluoride varnishes. Eur J Dent. 2013;7(1):41-7. [PubMed: 23408742]. [PubMed Central: PMC3571508]. 30. Vicente A, Ortiz Ruiz AJ, Gonzalez Paz BM, Garcia Lopez J, Bravo-Gonzalez LA. Efficacy of fluoride varnishes for preventing enamel demineralization after interproximal enamel reduction. Qualitative and quantitative evaluation. PLoS One. 2017;12(4). e0176389. doi: 10.1371/journal.pone.0176389. [PubMed: 28430810]. [PubMed Central: PMC5400240]. 31. Alexandria AK, Nassur C, Nobrega CBC, Valenca AMG, Rosalen PL, Maia LC. In situ effect of titanium tetrafluoride varnish on enamel demineralization. Braz Oral Res. 2017;31. e86. doi: 10.1590/1807-3107BOR-2017.vol31.0086. [PubMed: 29116298]. 32. Byeon SM, Lee MH, Bae TS. The effect of different fluoride application methods on the remineralization of initial carious lesions. Restor Dent Endod. 2016;41(2):121-9. doi: 10.5395/rde.2016.41.2.121. [PubMed: 27200280]. [PubMed Central: PMC4868875]. 33. Uysal T, Amasyali M, Koyuturk AE, Ozcan S. Effects of different topical agents on enamel demineralization around orthodontic brackets: An in vivo and in vitro study. Aust Dent J. 2010;55(3):268-74. doi: 10.1111/j.1834-7819.2010.01233.x. [PubMed: 20887513]. 34. Splieth CH, Treuner A, Gedrange T, Berndt C. Caries-preventive and remineralizing effect of fluoride gel in orthodontic patients after 2 years. Clin Oral Investig. 2012;16(5):1395-9. doi: 10.1007/s00784-011-0637-5. [PubMed: 22113711]. 35. Benson PE, Shah AA, Millett DT, Dyer F, Parkin N, Vine RS. Fluorides, orthodontics and demineralization: A systematic review. J Orthod. 2005;32(2):102-14. doi: 10.1179/146531205225021033. [PubMed: 15994984]. 36. Fejerskov O, Manji F. Risk assessment in dental caries. In: Bader JD, editor. Risk assessment in dentistry. Chapel Hill: University of North Carolina Dental Ecology; 1990. p. 215-7.